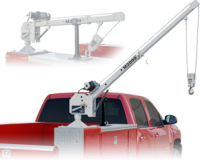 Adjustable boom elevation and reach allows you to set the lifting point right where you need it Horizontal Boom Storage Pedestal height customizable to fit application ( low provide option - ideal for service body toolbox mounting) 10' Detachable Pendant Control Options/Accessories ( Partial List) Rotation Lock ( standard on M2000 Wireless Remote Control Fold-Down Outrigger ________________________________________________ Model M1000 • 1000 lbs. Model M-15R • 1500 lbs. Model M-20R • 2000 lbs. Model M2000 • 2000 lbs. 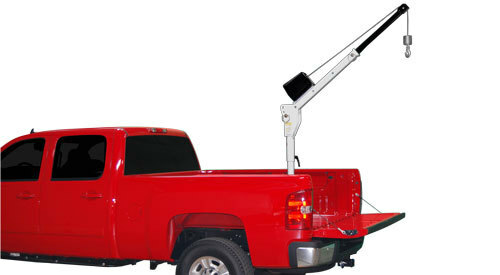 Adjustable boom elevation and reach allows you to set the lifting point right where you need it Vertical Boom Storage 12VDc • 120VAc • Manual Hand Crank Smal Footprint = less bed space required 360° Manual Rotation 10' Detachable Pendant Control ________________________________________________ Model P7 - VAN • 700 lbs. 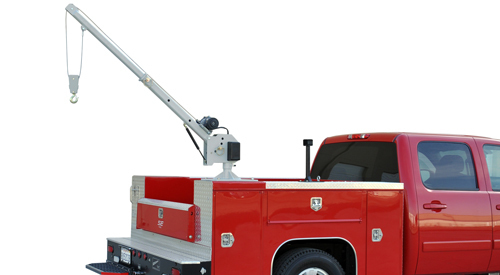 Model P10-DC • 1000 lbs. Model P10-MN • 1000 lbs. Model P10-AC • 1000 lbs. Model P-20 • 2000 lbs. Model P-5A (CCTV) • 1000 lbs.